It was -19 this morning when Gord and I left the house to go to a favourite local restaurant, Papa Joe's for a late breakfast and then groceries. 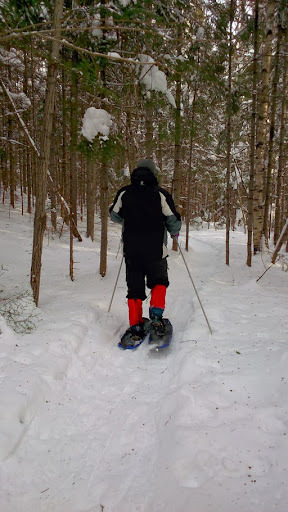 Just after noon we went snow shoeing, dressing warm. It was quite lovely, almost -11 by then. The soft winter light glows so beautifully through the trees. 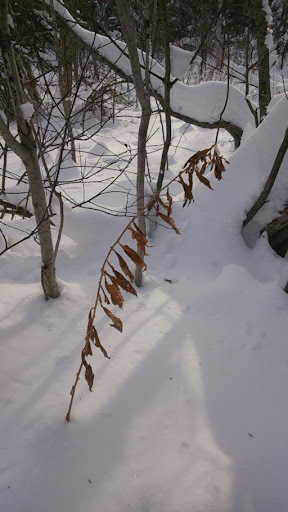 I took my new Sanyo Galaxy phone with me to try out its camera-- too cold a day to take the big camera. Once you got going it was comfortable; in the woods there was no wind. Gord stops every once in a while waiting patiently for me while I snap photos. There are so many little details that catch my eye even in a snowy landscape. I love the delicate lines of dried wildflowers against the shadowy white backdrop. Once back home I made hot chocolate for us both along with a quick snack of sliced apple, crackers and goat cheese. 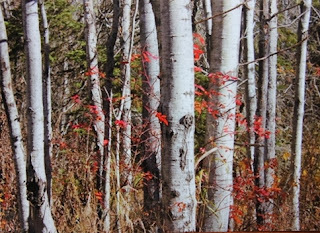 I gathered together some of my photos taken in late fall, my sketchbook and some colored pencils. On the right page I glued a black and white print and added a touch of colored pencil. 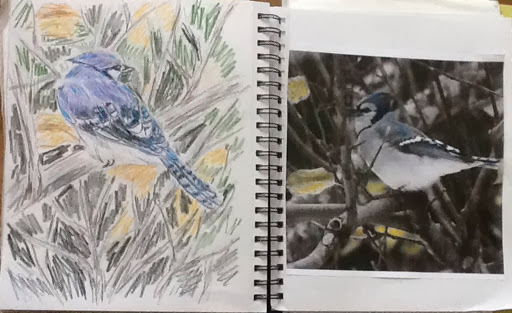 On the left I did a quick 'scribble sketch' of a bluejay. This is my way of getting acquainted with a subject that I'm interested in, looking for basic shapes, values and colors. I'm thinking as well of how I might translate it onto fabric. I've been thinking as one does at this time of my goals and intentions for 2014. As always I want to continue to exercise, eat well and look after myself. I want to continue being creative in some way every day. I intend to submit more articles for publication. I haven't recently. It's not that I'm pushing to develop a career; I'm retired. I think it helps me to push myself to develop artistically and to create contacts and network with like minded artists. This brings me happiness. And I'll admit it is a bit exciting to see ones work in print. As I write this my daughter is in flight somewhere over northern Canada as she makes her way back to Korea. It won't be long when she'll be back home to start her next adventure. It's a bit scary to be approaching 30 , coming home with no job, applying to university to do her Bachelor of Education. It's all unknown right now, and we tend to fear that don't we? I know it will work out in the end but there'll be a bit of stress as we progress. I'll breathe deep and try to exercise it off. May you all have a wonderful New Year! We are staying home, probably having popcorn and a movie. Simple, homey, just what we like. I'll be knitting a little on some socks while snuggled under an afghan. Stay warm for those reading in the northern hemisphere. Revel in the present, set your intentions for a good year. Keep commenting. I love to hear from you! There were six of us this morning who met for coffee. I went with a sore stomach(stress) and left feeling calm. 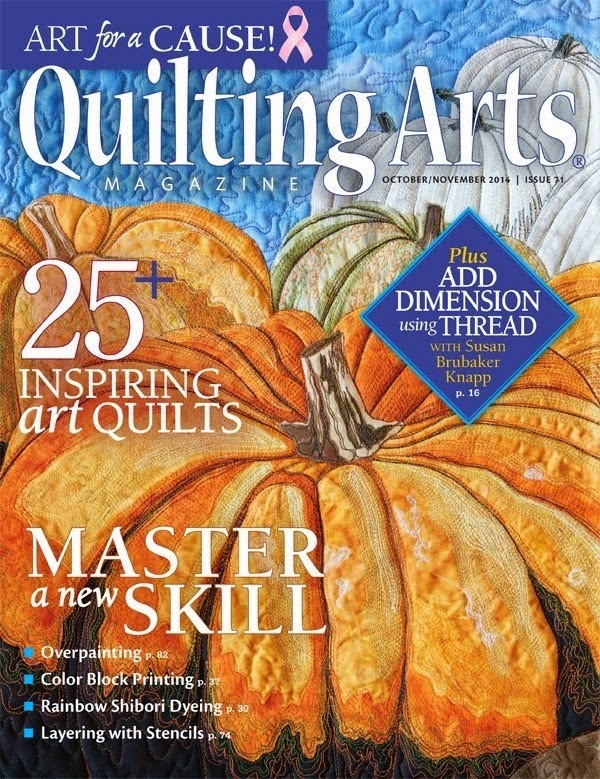 It is so good to sit and laugh with my quilting friends. After lunch I went into my sewing studio to putter around. 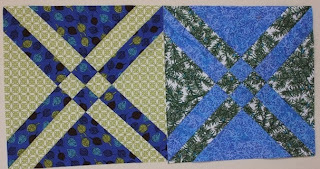 I'm still trying to make up my mind over a pattern for my next quilt but my friend Florence gave me an idea. The Garden Fence was demonstrated at the last guild meeting. Here's a tutorial. 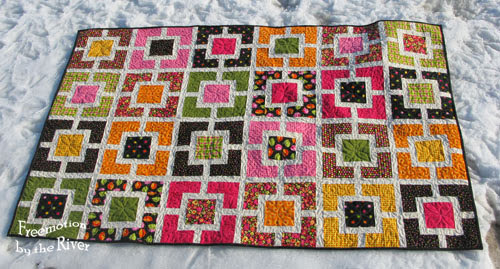 This is the quilt pictured on the blog. I like its modern feel. 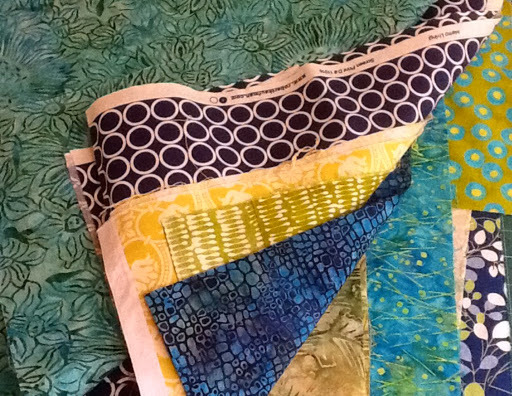 Here are some of the fabrics I ironed this morning- a mix of regular and batiks in blues, turquoises and greens. The circles look black but are actually navy blue. Also, I'm wondering about the dashing color. White is so high contrast although definitely modern. I like grey but I don't think it would be enough contrast, so I'm thinking about it. I will have to order a solid once I try out a few. 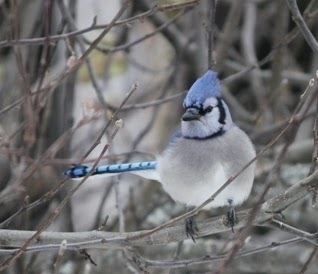 Next, I pulled out my sketchbook intending to sketch a bluejay as inspiration for my next art quilt. 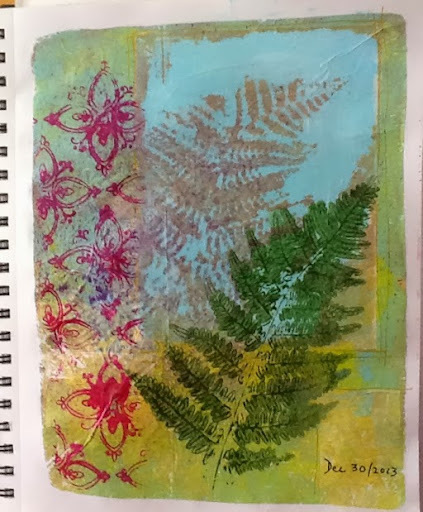 When I opened to a fresh page, one of my Gelli prints on deli paper fell out and I ended up glueing it down and playing with it. The medallion design along the left is screen printed and the foreground fern was printed from a pressed fern. 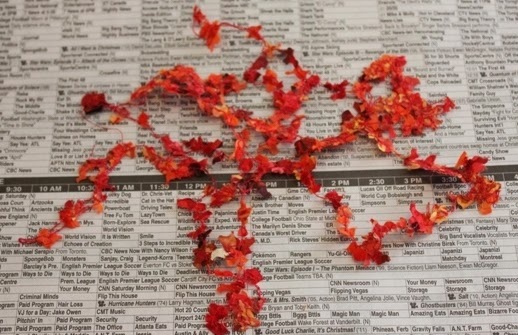 I keep a supply of plant material in old phone books. I can't believe it's been almost a week since I last posted. I've been cocooned within my family and thinking of nothing else. My sewing studio was occupied but I did do one more arrowhead block last week just to see how they might fit together. I'm trying to make up my mind on a pattern for my next quilt that I will take to my UFO days. It was the first Christmas in a while when all 3 of my children were home. We had a great week, but oh my, it does fly by doesn't it! 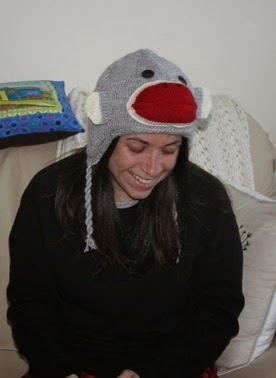 One of the cutest and favorite gifts was this sock monkey hat that I knit for my daughter. She has a monkey costume that she dresses up in over in Korea and her kids call her monkey. They'll get a kick out of the hat. It seems like it's been snowing forever! Each of my 3 arrived amidst storms which did cause me some stress. The departures have been somewhat better. 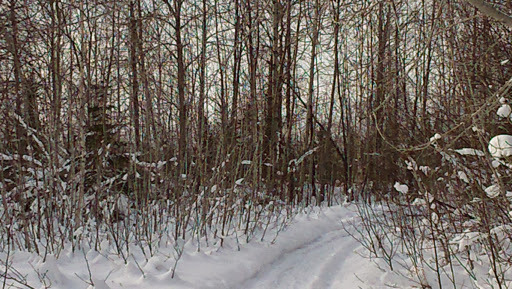 It's the first Christmas in a while with this much snow down so we've been out snow shoeing a couple of times. Yesterday, we went with my youngest son and my daughter. It was quite magical with the snow drooping and dripping off the tree boughs. My daughter is such a goof! My son is serious like his dad. I missed getting pictures when we were out with my oldest son and his wife because we dint think to take a good camera. My youngest took a few panoramics with his I phone. It takes a nice picture. Today, my youngest son left to drop my daughter in Fredericton where she will, weather permitting, start her journey back to Korea tomorrow night. We were sad but not overly so as she is returning to Canada in early March. I've been thinking about my next bit of art and what it shall be. 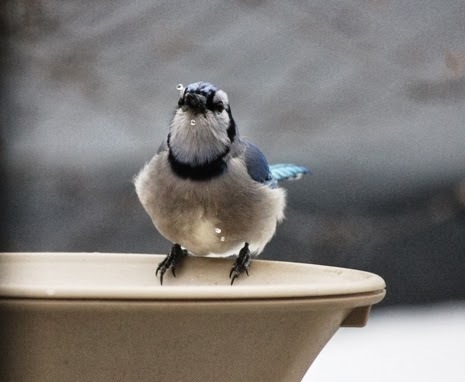 I printed out a couple of bluejay photos and have been thinking of trying to do something with them. 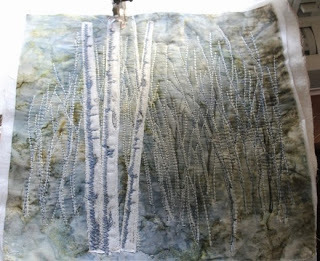 I'm still in the thinking mode, not quite sure how I will do them - collage, paint, thread painting or perhaps a bit of each. My husband has this week off though, so I'll be spending time with him getting outdoors as much as we can. 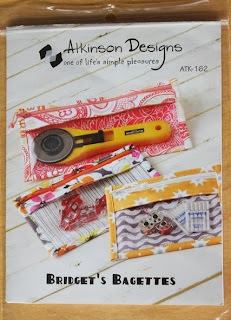 There may be a trip to Moncton and a fabric shop in store as well. Happy New Year! We plan to spend it quietly, perhaps a movie on the eve and a snowshoe on New Year's Day. Perfect. Saturday was an anxiety filled day for us. Our daughter, Caley, arrived in Toronto from Seoul. It seemed doubtful due to the rain and pending freezing rain that she would fly out later that day for Fredericton. Also, many flights were cancelled because of fog and bad weather in the destination airports around the maritimes. We had tickets to and attended the Celebration on Ice show which did help to take our mind of it even though we occasionally checked our phones for flight updates. Well we couldn't believe it when her flight was a go. Of course I followed the flight path all the way in to Fredericton on line! Yesterday, we made the 3 hour trip in the storm to pick her up. It took 5 hours going and 4 returning. She was excited to see all the snow. In the car she kept us amused by speaking in Korean and commenting on the weird things Canadian's do. Everything is so wide open here and our buildings seem short to her. She has been in Korea for over 2 years. So now my Christmas can begin. We only await the arrival of our 2 sons and their partners. I always have a few small gifts on the go right before Christmas and often I'm not even sure who they will go to. There's sure to be someone I'll think of at the last minute. 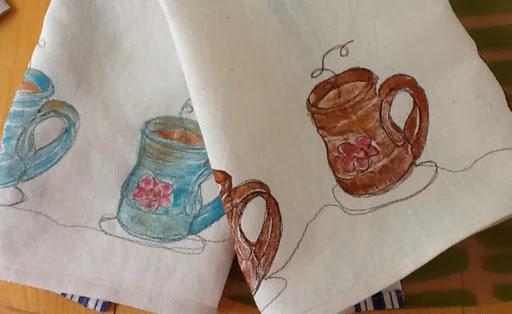 I finished two of the tea towels. I'm not in a panic at this point, keeping it all relaxed. The only thing I might be caught without are my family's favourite cookies. My daughter asked me to leave them for her as she is supposed to be flying in from Korea via Vancouver, then Toronto, then Fredericton on Saturday night. Now there is big storm pending and we're not even sure if she'll. make it to Toronto. If flights get cancelled the backlog could take days to clear up. We would still have to make the 6 hour round trip to pick her up. I'm worried she won't make it for Christmas and she only had just over a week as it is. The joys of winter travel! We'll just have to be patient and wait to see how it all goes. 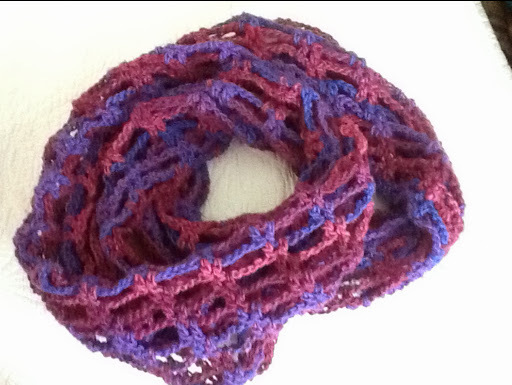 I've just finished sewing the ends in on this infinity scarf. I love wearing mine and continually get compliments on it. It wraps twice around the neck and is very cozy. One thing I like is that you can unwrap it once but leave it on when your in a store and it's not going to fall off. I hope you all have time for a comforting mug of your favourite brew and some quiet time. 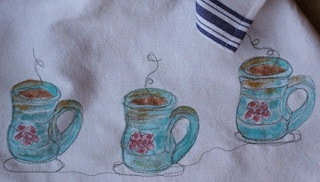 After heat setting the stamped mug image on the tea towel, I added some sketchy free motion stitching to the mugs. 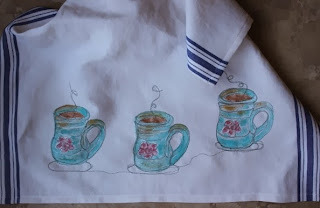 While I use the Setacolor fabric paints regularly, I haven't often used them on something that will get lots of washing like a tea towel would.Once, I did do a t-shirt for my husband and while the paint faded slightly after the first wash, it has held up on subsequent ones. I'm tempted to throw it in a wash to see how it holds up as I want to give it as a gift. I'll keep you posted if I do. 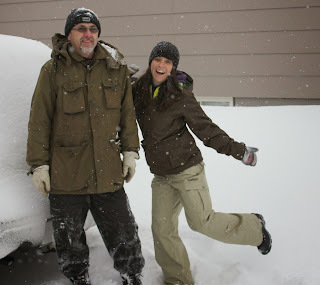 We went and did our in law visiting yesterday, since we knew a snow storm was predicted for today. 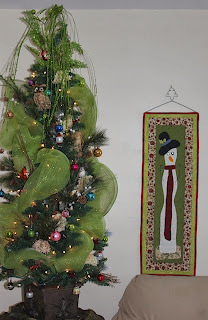 It started here around late morning-- a perfect day to get my little table top tree up and decorated. 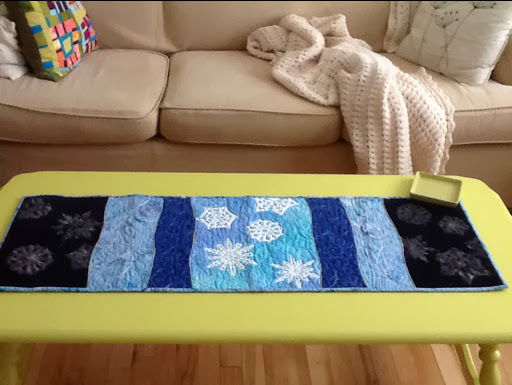 I've done a table topper for the last number of years since our house is small. I like that it enable me to decorate it easily in whatever style I want. I took a squash lentil soup from the freezer for lunch and I mixed up a quick batch of oatmeal cranberry muffins to go with it, definitely comfort food. A dove came to visit at lunch time, causing me excitement as we haven't had them yet and I do so love to watch them. It is sitting atop the feeder which is right outside my kitchen window; so close that I often feel as though I'm being watched. 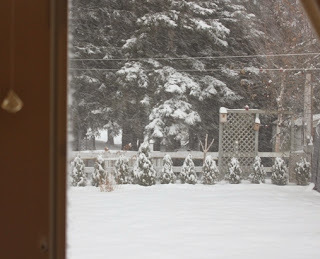 I always enjoy the view through my sewing studio window no matter the weather. I took a bit if time to refine the coffee mug stamp, no pictures because it's been glued and is sitting under a heavy book. Tomorrow, i hope to stamp the tea towel and stitch it. I hope you're weekend is not too frenetic and that you can take some time to relax and enjoy the little quiet moments. Brr, it is -15C without the wind chill! Yesterday, I knew it was coming and knew I better get an extension cord for the car block heater. My husband used them all on the Christmas lights. My fault, said he; I'm the one that put up an extra set of lights. He's been away all week and didn't think to mention that before he left even though he got the block heater ready! It was up to me. So, I stopped at Canadian Tire and bought an exterior cord. In the driveway I tore open the package and then got out and tried to plug it in. Ha, the block heater has a 3 pronged plug and this one didn't. I came in, had supper and went back to the store to exchange it. I had to get a 16 foot one but at least it would work. Again I tore it open in the car and got out and tried to plug it in. First the new cord wouldn't fit into the timer so I bypassed that. No problem, my husband could fix it when he gets home. (Later today, I hope). Then, with my arthritic hands, I couldn't get the heater plug to push into the cord. Just when I thought I might have to call on a neighbour, I got it on by leaning into it. So, the car started this morning. I picked up a bunch of these notebooks with my artwork from the copier to be used for gifts. I did a quick I pad photo so it's not perfect. They really did turn out well with great colour and detail. I also had my first go at carving the mug stamp and did a test run on paper. I'll remove the inside of the handle--forgot that--and add a few little details. I've got two tea towels ready to go but would like to do more. This linen was purchased from a fabric store by the meter. I only have enough for two. I checked a local kitchen shop yesterday and they didn't have anything. I may get around to a couple more if I have time. The plan is to stamp with fabric paint and do a quick pass with the sewing machine. Earlier, I made a spinach canneloni for the freezer. I did make a small one that will be for our supper. Now, I'm off to make my stamp and continuity hand sewing some bindings. Today, I made Hello Dolly squares and put the finishing touches on the small art quilt I think I'm calling Birch Grove. 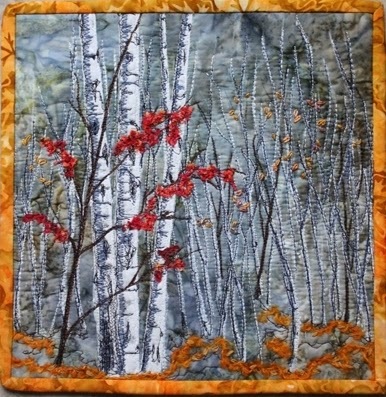 I like it so much that I will be doing more, but my next art quilt will probably wait until after Christmas. Since all 3 of my children will be home this year, I will have someone staying in my sewing studio for a few days and with my daughter coming from Korea, I won't have much time. According to my plan yesterday, I'm supposed to do a little decorating each day. I didn't yet today although I've kept busy. 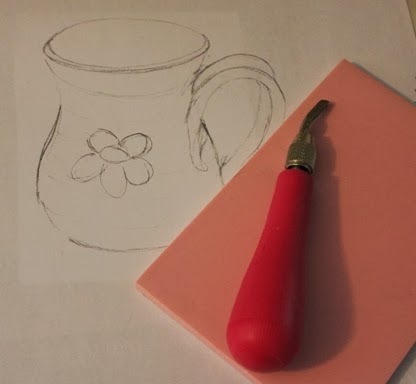 I've been sketching up a coffee mug image which I will use to carve a stamp. Poor planning on my part. It's a little too big for my carving block. Rather than redraw, I'll take it to the office store tomorrow to re-size it. I have to go anyway for something else. I could find a larger carving block but I think it's actually a bit big for a tea towel anyway. My plan is to print it with fabric paint onto a couple of tea towels and add a hi-lite of hand stitching to finish it off. Essentially, there are two weeks left for me to prepare the house and bake and finish up my last minute little gifts. On the22nd of December after sour daughter flies in from South Korea, we will be picking her up in Fredericton. We haven't seen in over two years, so we are of course very excited. As a little Christmas present to ourselves and really to distract us the day before hile she is in flight, we bought tickets for the ice show with Kurt Browning and Elvis Stoyko among others. 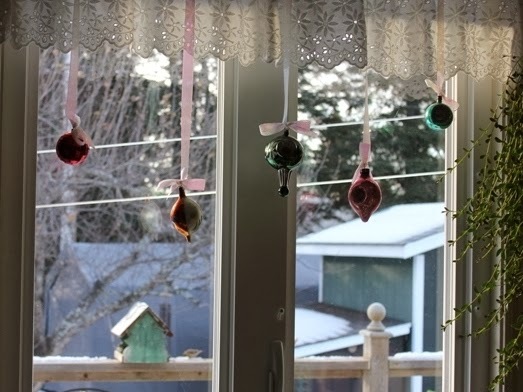 Today after doing my kitchen floor, I hung a few antique ornaments in my kitchen window which can be seen when you enter through the front door. I also spend much time here at the sink doing kitchen tasks and watching the birds at the feeders and in our apple tree. We really enjoy watching the birds drinking at the heated birdbath that our son gave us several years ago. It is also just outside my kitchen window mounted on the deck rail. 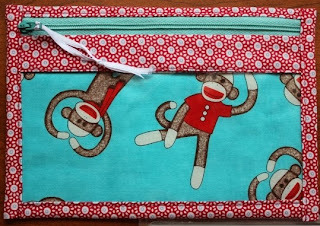 This morning, I finished the medium sized pouch from this pattern. 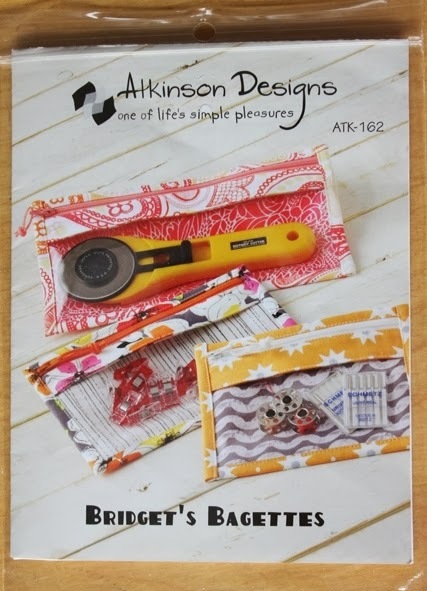 It was a bit of a challenge at first working with the vinyl, but all in all quite an easy pouch to put together. After a suggestion from a friend, I laid paper over the vinyl while sewing to keep it from sticking. Next time, I will follow my friend Sue's advice to use tissue paper. Definitely easier to remove. It's hard to tell in the photo but the front of the pouch is clear vinyl. The monkey fabric is actually on the inside. One more little gift done. Yes! After lunch, I mixed up a recipe for chocolate meringues that are baking as I type this. These will be our Christmas dessert this year served with chocolate whipped cream and berries. I've finished everything I planned for today; when the meringues are done, I have to go out for milk and I'll put the garbage out when I do. My husband is away for the week again. This is something new for us in the last month or so. The sun sets early here at this time of year and it can be a little lonely at night but generally I keep busy and don't mind it too much. He will be off for two weeks when my daughter is here so we are l;looking forward to that. Imagine my delighted surprise when I read the following blog post at the blog, Fibermania earlier today. 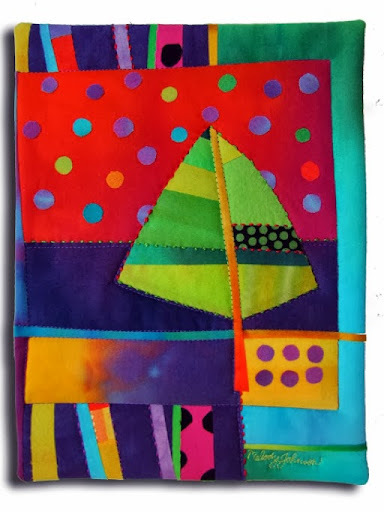 I'm to be gifted this wonderfully colourful and unique art quilt by one of my favourite artists, Melody Johnson. A gift from an anonymous reader. I do love any nature motif and anyone who knows me knows how much I love trees. Polka dots are also a favourite as well as the addition of hand stitching. I always like to add it to my pieces. I am quite simply astounded. I wonder if I'll ever know who. Sometimes the world does seem to be a wonderful place. This piece will make me happy every time I look at it. It will be treasured. As days often go, it's been a bit up and down. I met a friend for coffee this morning which was good and after lunch attempted to mix up some egg whites to make chocolate meringues to put in the freezer for Christmas dinner. Not so good. I've never had it happen before; they would not even begin to thicken. Of course it was the last of my eggs so it'll have to wait until next week now. 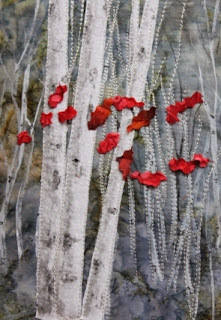 Since I finished up the thread painting on my recent piece, I decided to try out a quilt block that intrigues me. I'm thinking of doing it in greens and blues. It's called Anita's Arrowhead. 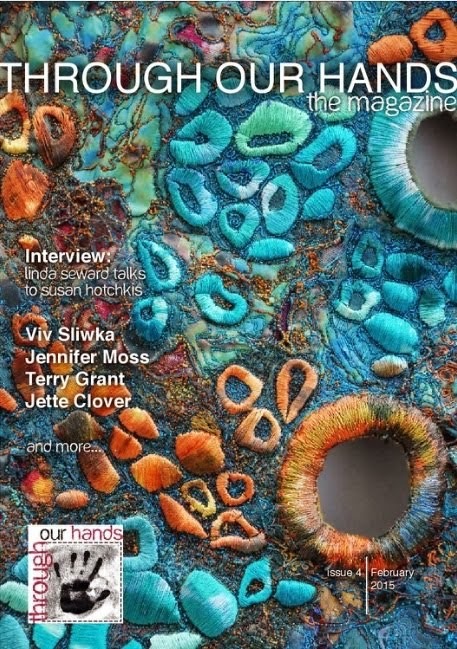 The PDF can be found here. 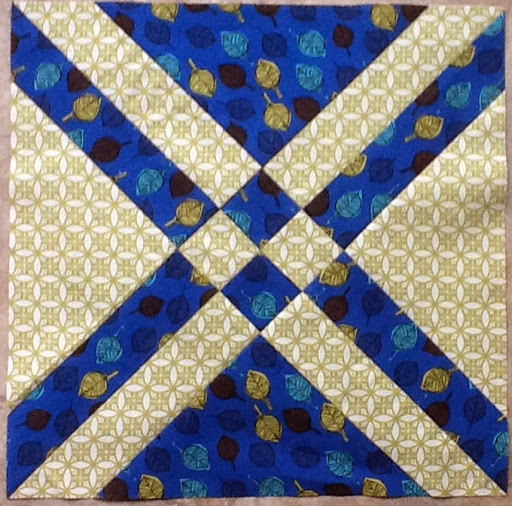 The directions make a 9 inch block but a friend told me that if I cut my 2 squares of contrasting fabrics at 11", I would get a 12 1/2" inch block or 12" finished so I tried that. 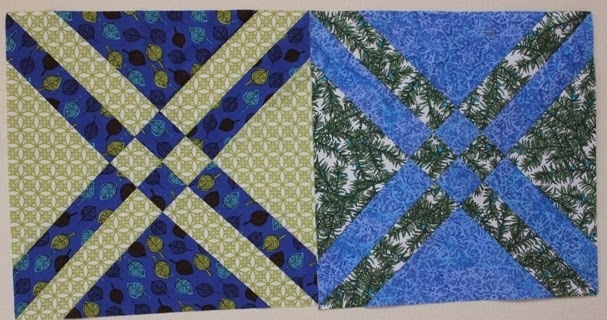 I want to make a queen sized quilt and thought the larger block might be better. Not sure. Unless I re-ironed some of the seams, they don't all end up as opposing. I'm wondering what your opinions might be on ironing open the seams? I want to do it for a wedding gift and since it also reminds me of an x, I might name it hugs and kisses, finding some way later to get the O's in. Is anyone out the superstitious? I wonder if the arrowhead is an ok block for a wedding gift! 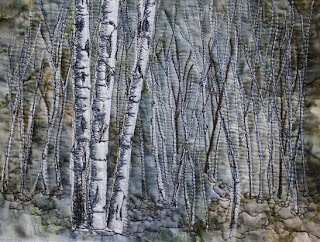 Even as I continue working on my fall birches piece, winter is moving ever closer and there's a definite snowflake theme going on lately. It's snowing outside. Schools in some parts of the provinces have been closed and there are power outages. We've had enough snow to warrant the passage of a plow but still nothing serious. 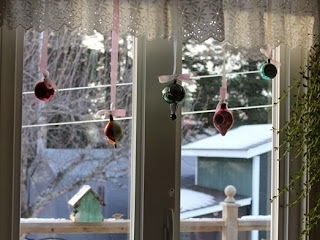 I've been slowly getting into the mood by pulling out my winter decorations. This is a runner that I made last year, one of a few I did using a stencil technique that was featured in the August 2013 Quilting Arts Gifts. Having no children at home, nor grandchildren, I put off decorating our small tree until I have to, usually a few days before Christmas. This year since were driving to Fredericton the weekend before Christmas to pick up my daughter who is flying in from South Korea (I'm getting excited! ), I will get it done a little earlier. 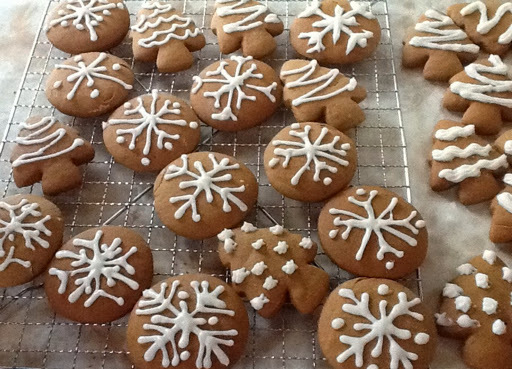 After being a little slow to get going this morning, I baked and then decorated my gingerbread cookies. 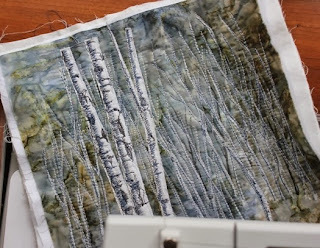 After lunch, I sat down at my machine and finished up most of the sewing on the birches. 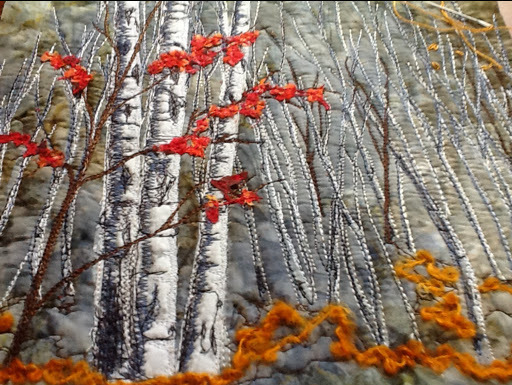 I added some gold accents with fibre and the leaves are stitched down. Before I add a backing and binding, I'll decide if it needs anymore. 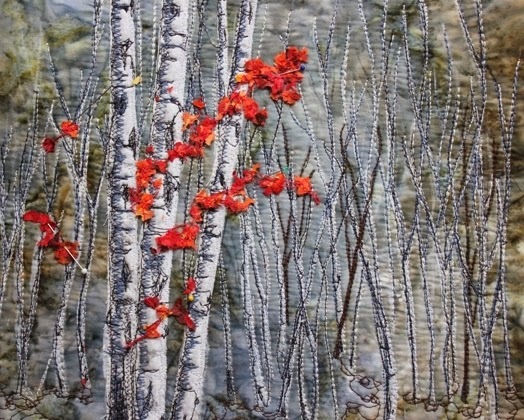 I'm also adding a few lazy daisy stitched leaves here and there. 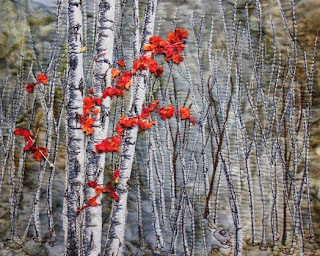 What I did differently on this birch tree piece (this is number 3) was to add the appliqués trees in the foreground and I quite like it. I see more birch trees in my future. I didn't get to my sewing machine today but I did get a new much needed home phone. And I had lunch with a friend and picked up one of my final Christmas gifts which I'm very pleased about! 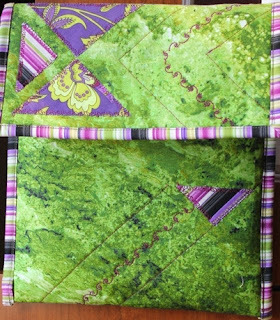 Later this afternoon, I spent some time relaxing by hand sewing down some binding on the Christmas placemats I made. 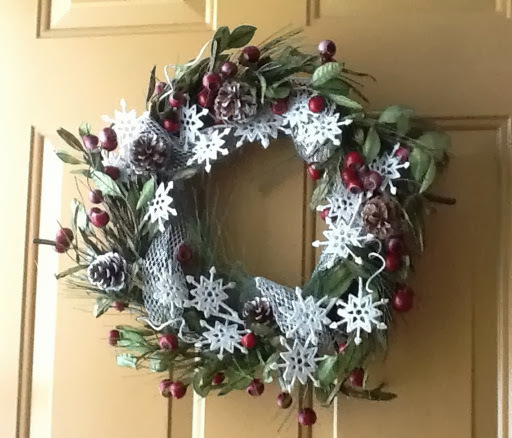 Also, I just finished adding the silver mesh ribbon, white snowflakes and pine cones purchased from the bargain store to the green berry wreath I had from last year. I've got my outdoor lights up, now my wreath, and this week, I'm going to start some indoor decorating and baking. I'm skipping a lot of the rich cookies and squares this year. With all my kids coming home, ( I'm so excited; I haven't seen my daughter in over two years! ) I do need a few treats. I'm going to do gingerbread cookies. Recently, I came across a weight watchers recipe for making chocolate meringues that are served with berries. I'm going to try making those ahead too. I picked up a large chicken on the weekend for our non vegetarian eaters and I plan to make a spinach cannelloni, also ahead, for the vegetarians. Tis the season! I'm starting to feel it! The light snowfall we've been having all day is certainly helping. It will be pretty tonight when the Christmas lights start to come on. Because of my cold, even though it's not too terrible, I opted not to visit my in laws today in case it's contagious. 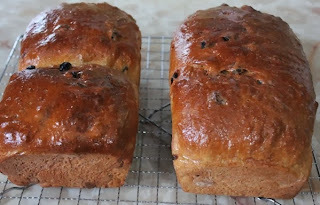 I decided to make a batch of raisin bread which I'd been wanting to try in a while. I'll freeze some for Christmas. 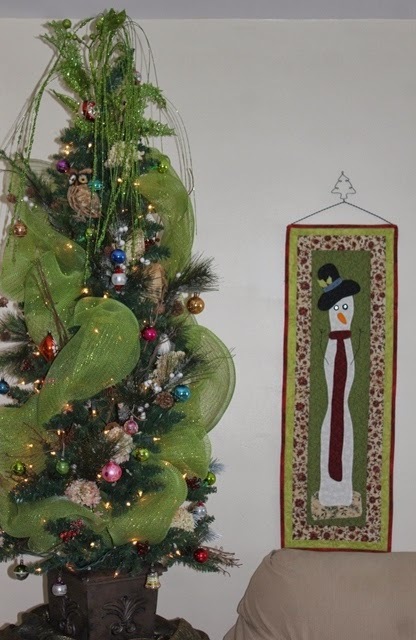 In my sewing studio, I first took some time to finish up one of my Christmas gifts. Time is ticking! 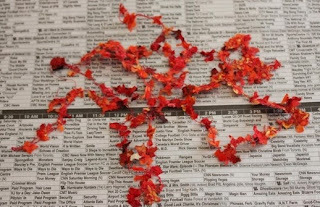 Then I ironed the Saran off my stitched leaves in between pages of the newspaper. I kept them quite lacy and thin as this is the way they are in the photo. There were only a few still clinging to the small tree. I couldn't wait to lay them out on my background! 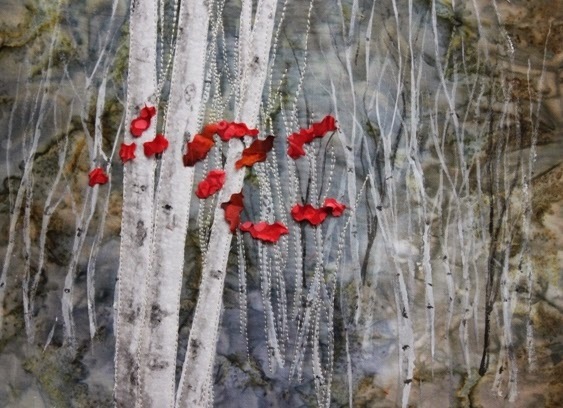 Tomorrow, I plan to stitch the small tree branches first before I stitch down the leaves. Yesterday, I attended a Pfaff workshop at our local Pfaff dealer. I found the Pfaff rep to be very knowledgeable and enjoyable to learn from. We were in a small room with 7 in attendance but her relaxed and quiet manner resulted in a lovely paced class. We also had plenty of time to finish our project with space in the middle to go for lunch at my favorite cafe. I did work on one of the mid range Pfaff machines that is presently on special; however, I did not get to try any free motion as there wasn't a free motion foot available. Anyway, the rep told me it would not be suitable for my needs and she recommended 2 other models which both have an auto tension feature. It being a small shop, those machines would have to be ordered. So, I'm not sure what to do yet. We made a fun little case for the I Pad and got to experiment with some embroidery stitches which I don't have on my basic machine. Today, my sore throat seems worse again, so I've stayed at home. This morning, I cut up vegetables and set them to simmer for a veggie stew. I'll add dumplings to it shortly. 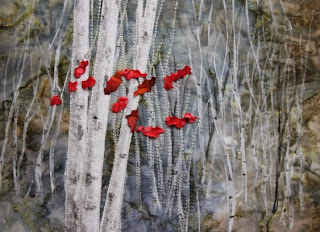 This afternoon, I finished all the stitching I plan to do on the background and foreground trees. I had to stop myself before I added too much detail. It was supposed to be sort of minimalist! 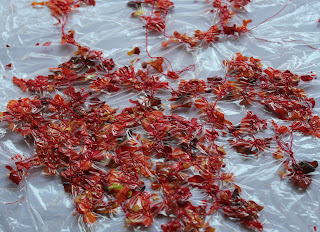 I've taken a few pictures of my process to make the needle lace leaves. This is something I've shown before that I learned a few years ago at a Laurie Swim workshop, but this time once I'm all done, I will try to add it under my tutorial heading at the top of my blog for future reference. The first step is to cut up a bunch of tiny bits of different shades of red fabric with a wavy rotary cutter. I generally cut diagonally in one direction and then the other, making some in different sizes. Above you can see that they are layered between 2 pieces of Saran Wrap Plus and hooped. I next did a free motion meandering all over, making sure all the little bits of fabric are connected by the thread. That's as far as I got for today. 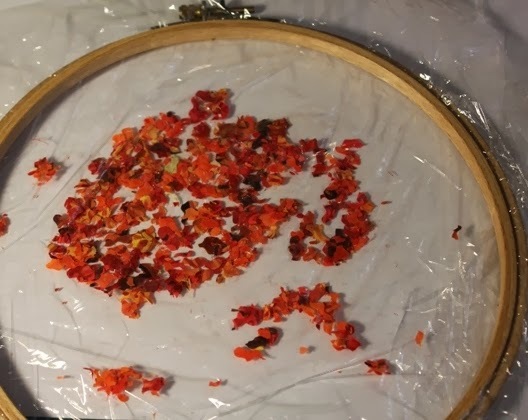 I will iron it between 2 sheets of newspaper which melts and removes the Saran, and then it will be ready to cut up and stitch onto my piece. Now, I'm going to take a break with a cup of tea and my book before it's time to mix up the dumplings. 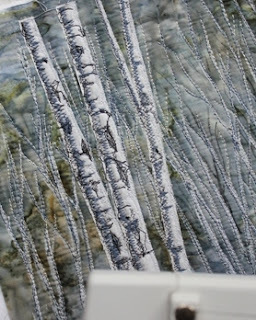 I hope you'll feel like bearing with me in this process as I slowly add free motion shading and highlights to my birches. It is a slow process. I spent about an hour and a half today adding some darks and lights in both a free motion straight and zig zag stitch. Here I've added some whites and medium grey/blues. Sorry, there's a bit of a glare from my window. Next, I added some darker greys and then some black. I have to admit that I'm anxious to get to those red leaves but I must finish the background first. Tomorrow, I'm going down to the local Pfaff dealer to take a workshop where I'll also be trying out another machine. I hope I'll be feeling OK, as today I seem to be coming down with a sore throat. Fighting off any illness with Addison's disease can sometimes be tricky, often requiring more rest than a normal person. It's not an early start or a long day so I should be OK. I added the finishing touches to my zippered pouch that i showed yesterday and had just enough time to do a little free motion stitching on my birch trees piece.It's going to measure about 10" by 10" when finished. 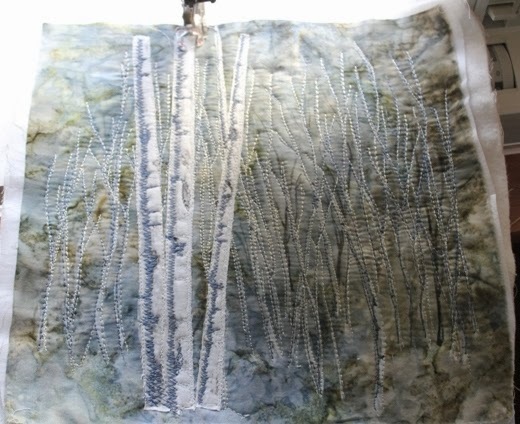 I've stitched down the trees so they won't move as I work on the background but I will be going over it later with free motion shading in a zig zag. I only had time to start the background trees and I couldn't resist auditioning some red leaves that I'll add to the foreground at the end. I think they'll have to be cut a little smaller. you get the idea. They are quite striking. 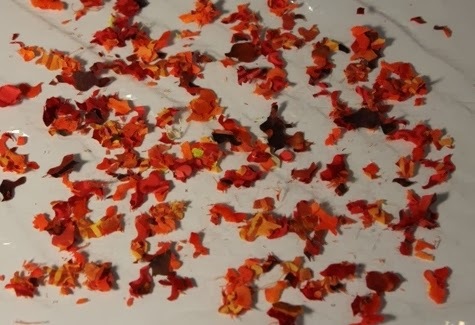 Here is one of the reference photos I'm using. This past weekend, we put out our heated birdbath and a feeder of sunflower seeds on the deck. It doesn't take the birds long to find it. 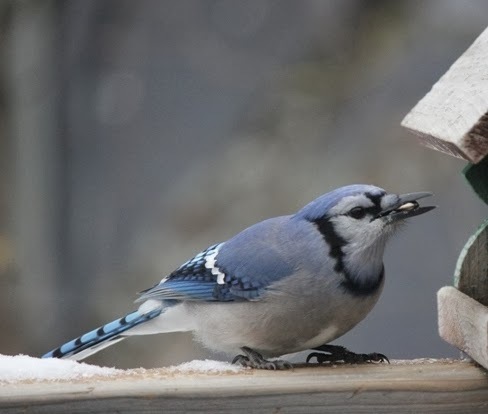 The bluejays can be bullies but I sure love their coloring. They really stand out against the wintry grey background. Perhaps they'll be fodder for a future piece. 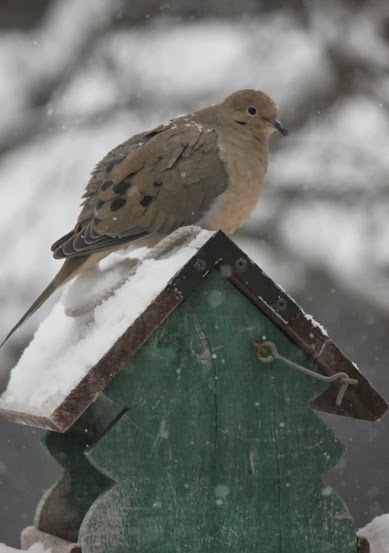 The feeder sits only a few feet from my kitchen window and i so enjoy watching the birds there all winter.